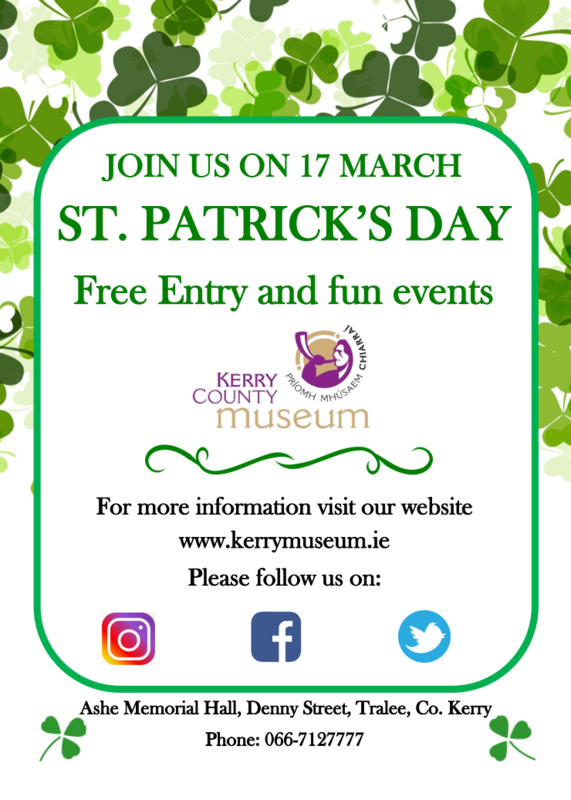 We are delighted to offer free entry to celebrate St Patrick’s Day in the Museum! If you are looking for something fun to do before or after the parade why not pay us a visit and explore our exhibitions? Have a look at Casement in Kerry, Art in the Park Off the Rails and the Main Museum Gallery upstairs and then head downstairs to dig up Viking skeletons in our Archaeology Hall, dress up in medieval costume and stroll through the streets of Geraldine Tralee complete with the sounds and the smells. Picture opportunities include being locked up in the stocks at the market cross! An experience for children and adults of all ages. Please note that entry is free and all are welcome but children must be accompanied by an adult at all times.